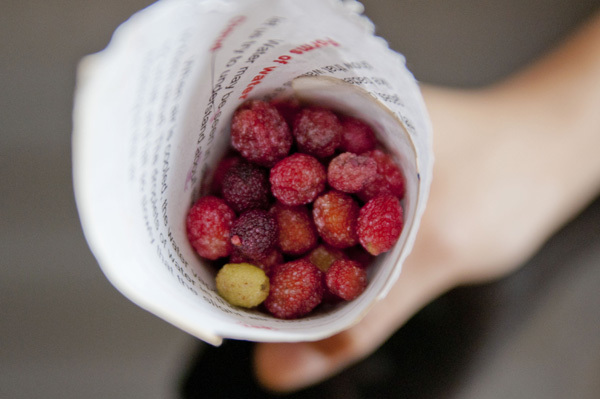 You are viewing the archive for the ‘Wild Berry’ tag. 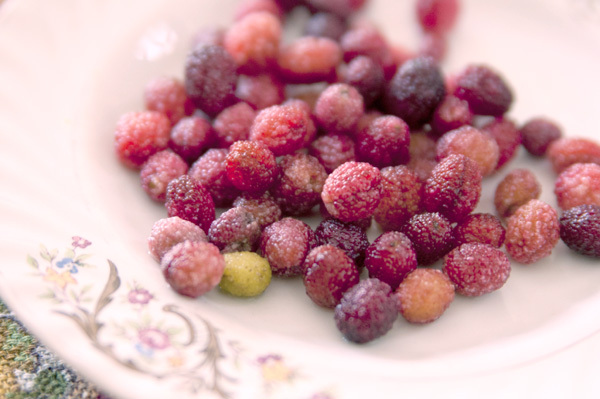 Often described as one of the tastiest wild fruits, Kafal, is a berry found on the foothill of the Himalayas. This raspberry-looking fruit with sweet and tangy flavors has a thin fruit coating with a large stone core, thus it’s a drupe. Eating kafal requires you sucking on the fruity outer layer followed by spitting out its pit. 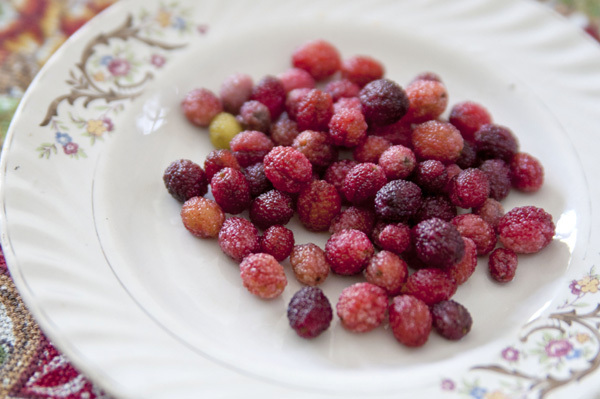 Kafal is picked from a dozen-meter long wild trees during May and June. Kafal trees are found on hills of Nepal and Northern India, between the altitudes of one and two thousand meters above the sea level. Kafal changes to reddish purple color ellipsoid-shape fruit at its maturity. 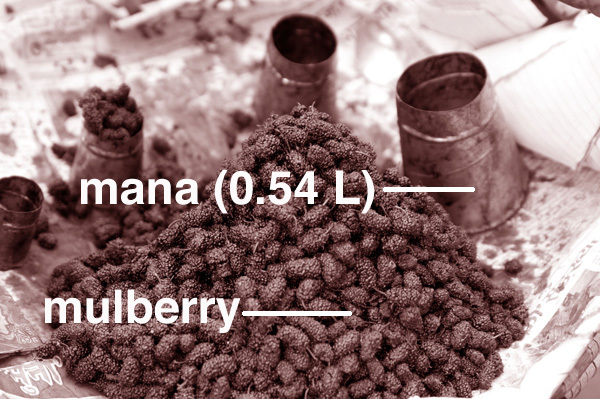 In scientific journals, kafal is mostly called Myrica esculenta, but also often referred as Myrica integrifolia and Myrica nagi. In ancient Sanskrit language, kafal is often called Kaiphala or Katphala, and believed to have a medicinal property in its tree bark. Still today, street hawkers go door-to-door to sell kafal from a bamboo baskets in Kathmandu. Once ordered, kafal are measured in a rusty tin container called manas (~ half liters), poured into a paper cone made from old newspaper, and sprinkle with spicy salt seasoning. Since the shelf life of kafal is very short, only 2-3 days, people interested in eating kafal are recommended to fly to Kathmandu during May-June. Kafal is celebrated with unprecedented number of songs and stories unlike any foods in the region. Even a surname “Kafle” is said to be in honor of those kafal trees that gave fruits to people for millennia. There are many songs about kafal such as Reli khola bagar kafal pakyo lahar (Nepal) , Kafal gedi kutukai (Nepal), Kafal pakyo hola banma (Nepal), and Rangeelo kumaon kafal kheja (Uttarkhand). 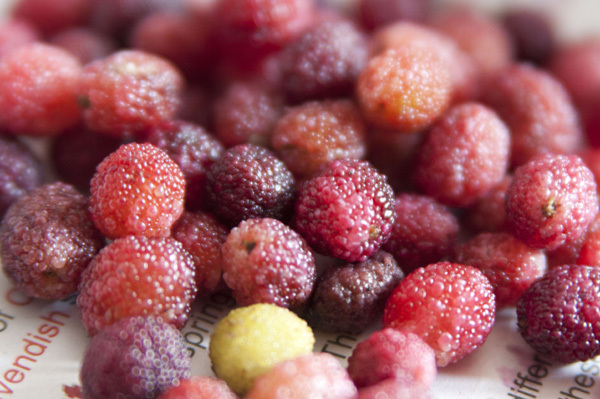 There is much folklore interwoven with kafal and life in Himalayas than any other fruits. Here are my two favorite tragic tales about why birds sing during kafal season. A Nepali tale of a brother who leaves his sister to join an army. He promises to return every year to enjoy kafal together. He never returns, but she continues to send message every year when kafal ripens. Even after her death, she now returns as a bird to let us know “kafal pakyo” or “kafal is ripe”. Another story from Indian state of Uttarakhand is about a mom, who picks up a basket-full of kafal to sell. She asks her daughter to look after the kafal basket and not to eat any fruit. When mom returns, she realizes the kafal has lost some weight. Suspecting her daughter must have eaten some, mom punishes her by beating. The daughter kept on crying that the she didn’t taste any kafal. It rains and kafal gain back some weight that they had lost due to scorching summer heat. Unfortunately the girl died, and now she comes back every year in kafal season as a bird to sing “kafal pakko, meil ni chakkho” or “kafal has ripened, but I didn’t taste them”. Often these stories are tragic, may be ripening of kafal symbolize change of season and end of beautiful spring, kafal being one last sweet fruit of spring before a harsh summer.